Construction is the most dangerous form of work in the United States currently and almost one out of five workplace deaths occur at a construction site. Our country relies greatly on the construction trade and commerce and industry would come to a halt without the dedicated efforts of our construction workers. It is for this reason that we must take care of those who knowingly enter dangerous careers and look out for their families in the event that the negligent actions of another worker or the failure of an employer to follow proper safety protocol results in the death of an employee. If your loved one died due to injuries suffered on the job, you are entitled to file a claim for wrongful death if the injuries were the result of negligence. Many things can go wrong on a construction site and work conditions can change rapidly, easily putting a worker in harm’s way if he or she is not aware of a hazard. The common causes of construction fatalities are the following. Falling Objects— Even with proper protection, workers can suffer severe or life ending injuries when struck with an object from above. Slips, Trips and Falls— The majority of construction accidents involve falls or falling objects and hazards must be marked so that workers are aware of slippery conditions, obstacles or uneven or weakened platforms. Electrocution— Many deaths that occur due to electrocution are the result of poor communication or lack of warning signs. An employee may begin to work unknowingly on an electrical component that has a live charge or come in contact with an object that is drawing a current. Pinch Point Accidents— A pinch point is any point in which two objects can intersect or collide with one another. When a person is occupying a space that is considered to be a pinch point, he or she may easily be crushed under the weight of machinery or objects that are moved into one another. These types of accidents often result in extremely debilitating injuries or death. If your loved one has died in a construction accident, you have the right to investigate the cause of the accident in order to determine whether negligent actions on part of your loved one’s employer or coworkers resulted in the accident. If it is determined that negligence was in fact the cause of your loved one’s death, you have the right to seek damages for the loss you’ve incurred as well as the income that he or she has been providing for your family. You may be awarded compensation for the cost of medical treatment prior to your loved one’s death, funeral costs, loss of consortium— which is defined as loss of companionship— and the estimated value of your loved one’s future earnings. 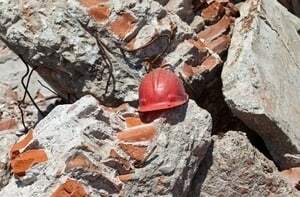 For more information about your rights and to determine how best to pursue a wrongful death lawsuit involving an accident at a construction site; contact the Rosenfeld Injury Lawyers LLC. We are a leading personal injury law firm that has extensive experience representing families just like your own when seeking damages from negligent employers when their actions have resulted in the death of another. We will be happy to consult with you free of charge in order to review the details of your case, answer your questions and guide you through the process of litigation so that you are informed of everything that you can expect as well as the time frame in which you can expect things to happen. Each of our lawyers works on a contingency agreement basis and this affords anyone the opportunity to access our services because we will never ask you for payment at any point unless we have successfully negotiated a settlement on your behalf or taken your case to trial and received a judgment in your favor. If we are unable to take on your case or agree to represent you but fail to secure compensation on your behalf, you will owe us nothing and our services and advice will be free of charge.